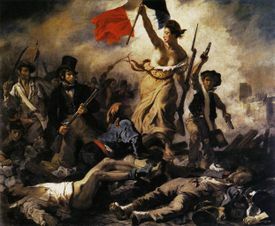 Through history, and perhaps above all during the 19th century, France has played a leading role in the arts and has been influential in their development both within France and elsewhere, especially across Europe. The French artists, the poets and writers, the music and the architecture are perhaps the best known examples - think of the chateaux of the Loire Valley, or perhaps the Impressionist Art movement that largely originated in France, or the great novels by Victor Hugo or Marcel Proust. But culture is not just found in the great arts of the past. During the 20th century the world has changed, and French film directors have had a great influence on the industry, while television has also emerged as a great cultural force around the world. While rarely achieving the commercial success of their US counterparts, France has created many great films - perhaps most of all with the black and white films and nouvelle Vague experiments of the 1950s and 1960s. See French film directors for more information. Do the symbols of a country form part of its culture? Not always perhaps but in the case of a few it is the case. Among the best known symbols of France are the Flag of France (the only official symbol); Marianne, symbol of Liberty; the cockerel and others...see French symbols for information. Likewise the French currency and the French Franc are an integral part of french history and culture, especially now that they have been superceded by the euro.